There are many questions and concerns about the products we find and use in the laundry room. These questions range from allergic reactions to the machines themselves. Due to these concerns we have created this guide to address the sources of air pollutants and possible accidents that can occur in this frequently used room. The laundry room holds household products that contain complex chemicals and compounds that could affect your family’s health. Asthma, breast cancer, lung disease, organ damage, Autism, Alzheimer’s, Multiple Chemical Sensitivities and general indoor allergy symptoms are just some of the ways that these products can affect your family’s health. We have found a free list of frugal non-toxic home-made household recipes, including liquid laundry detergent and washing powder. Detergents and fabric softeners contain many chemicals that can be dangerous. The largest problem here is the packaging. Most laundry products are contained in brightly colored containers and it appears tempting to young children. Many children have ingested laundry detergent pods on accident believing that they are candy of some sort. All laundry products should be stored out of reach of children to prevent accidental poisoning. Watery eyes, skin rashes, respiratory difficulties, and headaches are a few symptoms of allergic reactions. Your store bought detergents and fabric softeners contain chemicals, which in some individuals can cause these symptoms according to the National Center for Biotechnology Information (NCBI) and the National Institutes of Health (NIH). Those of us who suffer from the effects of these chemicals may choose to switch to the green products now on the market as they are made with safer ingredients or make your own detergents. Chlorine bleach should never be mixed with other chemicals. When mixed with acids, chlorine gas is produced. Chloramine gas can cause shortness of breath, coughing, nausea and pneumonia just to name a few. Bleach should as a rule should only be mixed with pure water. 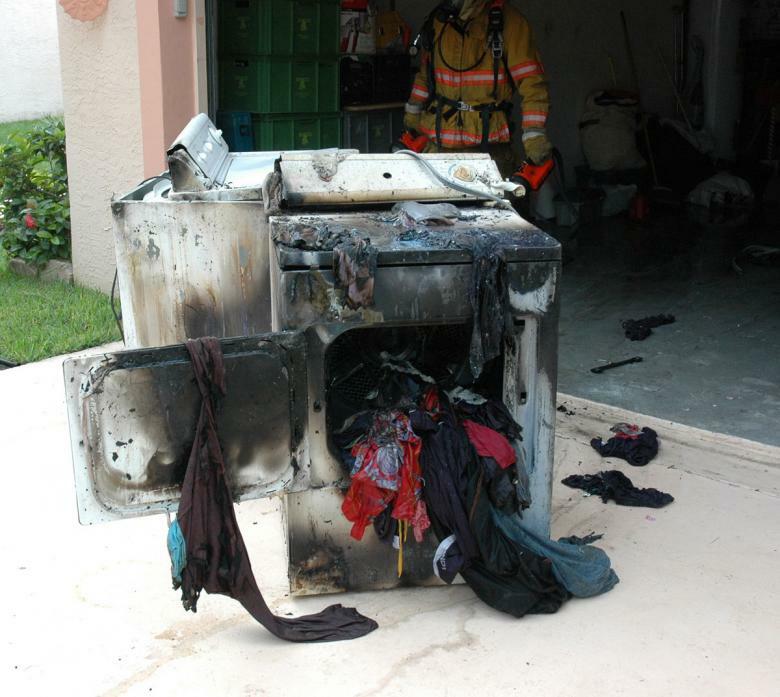 Another laundry related hazard that could occur in your home is a fire. There are an estimated 15,000 dryer related fires a year. Most of these fires could have been prevented by regular cleaning in and around your dryer. This includes removing the lint from the trap after each use and regularly inspecting the duct work for a buildup of lint. Cleaning the lint screen with hot soapy water and a soft brush will also reduce the risk of a fire by allowing the air to flow freely through it. Flammable chemicals should be thoroughly rinsed from clothing and rags before they are put in the dryer. Wash these items multiple times and consider line drying them outside. If you are in the market for a new dryer consider one with a moisture sensor. These sensors monitor the moisture in your clothes and stop the dryer when they are dry thus preventing over-heating and possible fires. Anytime there is water and electricity near each other there is the possibility of electrocution. Ground fault circuit interrupter (GFCI) outlets are a must in these situations. They are designed to trip when they are shorted out by damaged wiring or water. GFCI outlets have two buttons on them a test button and a reset button. You should check your outlets once a month to make sure they are still functioning properly. To do this press the reset button and plug a lamp in and turn it on. You should then press the test button and the light will turn off. If the lamp stays lit then your GFCI outlet may be malfunctioning and you should call an electrician. Storing food in or near your laundry room could be potentially dangerous. The chemicals from your laundry detergent and fabric softener can permeate food. If you must store food in or near any chemicals make sure it is in an air tight non-permeable container. This should include pet food. All chemicals should also be stored below all food products and food preparation surfaces. Chemicals should also be stored according to the guidelines on the product label.